A black and white negative of the Irwin's at Stonehaven's aviation garden party. 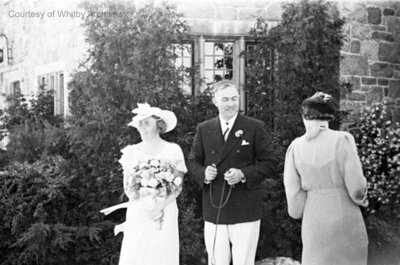 From left to right: Kathleen Irwin, G. Norman Irwin and an unidentified woman. Stonehaven's Aviation Garden Party, June 1936, Marjorie Ruddy. Whitby Archives A2013_040_197A.